The Special Olympics Athlete Leadership Program is a program designed to help engage our athletes outside of their sports competitions. 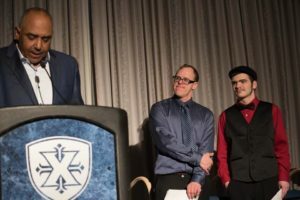 The mission of the Athlete Leadership Program is to empower athletes to develop leadership skills and utilize their voices to assume meaningful leadership roles, influence change in the Special Olympics movement, and educate communities around the world that results in positive life changes. Spreading the word of Special Olympics and telling their story! (Above) Chad Mayer and Jesse Shelton, co-emcess of the 2017 Champion’s Ball, wait and listen on the stage as guest of honor, Marvin Lewis speaks to the crowd. 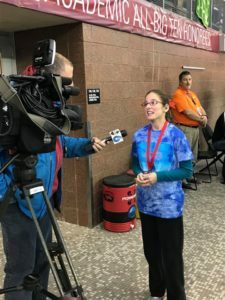 (Left) Kassey Willis talks with local Columbus News station about her experience as an athlete at the 2017 State Aquatics Meet at The Ohio State University.